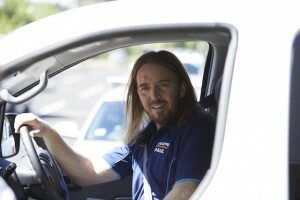 Tim Minchin · Australians! ‘Squinters’, a new six-part comedy series, starts 7th February at 9pm on ABC! The other commuters include: a single mum keen to avoid her teen daughter making the same mistakes in love, while juggling a new romance of her own; a clueless ex- school bully hitching a ride with the guy he tormented; best girlfriends whose friendship is tested when one becomes the other’s unlikely boss; and a middle-aged man grappling with a flighty boyfriend, a possible redundancy and a recalcitrant dog. Tim joins an extraordinary ensemble cast including: Academy-Award nominee Jacki Weaver, Mandy McElhinney, Miranda Tapsell, Damon Herriman, Sam Simmons, Andrea Demetriades, Wayne Blair, Justin Rosniak, Christiaan Van Vuuren, and Jenna Owen, along with young comic talents Susie Youssef (Rosehaven), Rose Matafeo (NZ’s Funny Girls), Steen Raskopoulos (BBC’s Top Coppers) and YouTube sensation John Luc (aka ‘MyChonny’), as well as the UK’s Nyasha Hatendi (Hulu’s Casual). Squinters is produced by the team at Jungle Entertainment (No Activity, The Moodys and the forthcoming Sando). We would like to distribute this show to Netflix and Hulu. How can we see this in the US? we can’t download the app here. Boo ? I live in the US and can’t download the I view app from the apple store. Is this supposed to work in the states? Do they plan to sell it to UK audiences? Would like to see it over here too!! Fun premise. Would love to see in US. Make it a hit, Tim!